 The Free Framers email list, framers@omsys.com, which offers very fast turnaround on messages, and does not restrict what members post (within the bounds of Netiquette). To subscribe to Free Framers, email the message body "subscribe framers" (without the quotes) to <majordomo@omsys.com>. 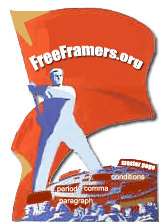  The new Free Framers list archives. We have Eric Lawson to thank for the major technical work involved in creating this fully searchable system.  The Free Framers Wiki, is a collaborative FAQ, at the request of Hedley Finger and Dennis Hays, noted long-timers on the list.  The former InFrame Web site is also housed here.  A collection of freeware and shareware tools for enhancing FrameMaker, and a comprehensive set of links to other products and resources, are still to come. This Web site, and the Free Framers list, are hosted on Omni Systems servers. This is Omnis giveback to the community; it is not used commercially to Omnis benefit in any way. Omnis product, Mif2Go, is often mentioned on both the Web site and the list, but only where any relevant product (including its competitors) might be mentioned. We think it is very important to keep community resources free of commercial exploitation, which inevitably leads to their abuse.